The PH301 imitation security camera is an easy way to deter intruders or vandals and make your property appear to have a robust security system. The ABS plastic housing makes it look like a real, functioning camera. 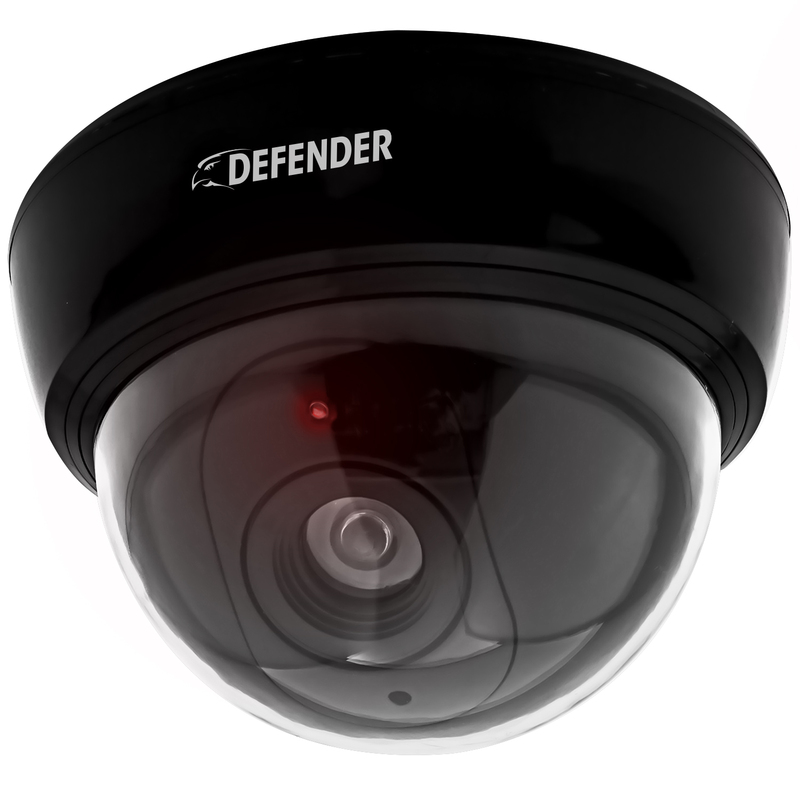 This camera can also be used in combination with a functioning security system to heighten the effectiveness. Customers, neighbors and visitors will all think that you have a robust video surveillance system. Deter suspicious activity inside and outside with this camera. The imitation camera is made of ABS plastic for durability and will not rust. This makes the PH301 incredibly versatile and practical for convenience stores, parking lots, apartments, entrances, and many other places! Defender does not endorse our products for illegal activities. Defender is not responsible or liable in any way for any damage, vandalism, theft or any other action that may occur while a Defender product is in use by the purchaser. Just finished hooking it up. Toyughest part was running the lines through the ceiling. Otherwise it was awesomely easy and image looks great. I'm happy with the quality of the cameras. However, If Defender can update their mobile app, ClearVu, then i would be great. Everytimes I go into the app, it seems to loading a little slow and the images do not seem to be really clear. Beside that, everything else is OK.
Added this to the 6 camera set up. Solid, heavy duty construction. Cameras look like they'll hold up well to the environment. Some difficulty with set up as none of the instructions mention that it's required to add the port# at the end of the IP address to gain access. Also, default user name and PW to gain access to the DVR menu was not immediately apparent causing additional hair pulling. Called customer support and immediately got through to Michel who had me set up in under 20min, including remote viewing through my phone. Thanks Michel! This is my second system from defender. easy to hook up and set up. I had it all done in 30 minutes. including being able to view on my phone..
Bought the sentinal wireless 4 ch system on11/9/15 at 10 am, received it on 11/10/15 at 7 am Works great . I bought this product a month ago, and I love it, with one MAJOR caveat. The wireless receivers for the cameras (1 per every 2 cameras) can conflict with your existing Wifi. For example, my 100Mbps home Wifi drops to an useable 0.40Mbps whenever the wireless receivers are turned on. This happens no matter where I replace the receivers in my house, even downstairs inside of a concrete surrounded room. The only solution, per the vendor, is to move your existing Wifi from the 2.4Gz range to something else. This is rarely possible on home Wifi systems (although if you can force all equipment and clients to the new N wifi bands it's possibly workable). For example, my existing Comcast Wifi will not let me disable the 2.4GHz band. This is a better solution, if the Defender cameras let you manually pick Wifi channels (there are 15 of them), you could move your different Wifi receivers and routers to different channels and avoid the conflict. But you can't. In the current state, my $1200 purchase is worthless because I can't turn the camera receivers on. Very disappointing. And this is such a great product otherwise. Another solution would be if the cameras could just hook to your existing Wifi router and not need secondary receivers. I purchased the cameras about a month ago. Installation was very easy, but the wireless range is very disappointing. I live in a one story house and the furthest cameras are only 65 ft. away from the receiver (three of the six cameras are this distance away). They are constantly losing signal and freezing. The cameras that are 10-40 ft away work as advertised. The night vision is excellent. If it weren't for the poor range I would have rated this with 5 stars. Purchased this system 3 months ago works great. I have been very happy so far. This is the second system I've bought in the past few months. Installation is easy, but camera placement is crucial. While the advertised range is several hundred feet, in reality it is much less in a real life situation. Despite that, it is still a very good system. Tech support is great. Michel in particular does a great job helping to get everything up and running. I have 4 of the cameras mounted. The cameras are easy to pair and the floodlights (I have two mounted near floodlights) do not affect the image at all. The picture quality is good and the wireless range is also good. The email notification is nice so you can see who is coming and going. The cameras are well built and appear to be very durable. I would recommend this product. Great security system for the money!! The setup of this system is as simple as can be. The video quality is good and the email notifications with the motion detect are great. I bought the system with 6 cameras and have had two of them going for a few days now. The hardest part of this system is figuring out where to put the cameras. I am waiting for dusk to see how the exterior lighting at my house affect the cameras. I have one mounted right above a set of flood lights and there is no light interference at all. I will probably end up getting another two cameras. I highly recommend this system. good product, easy too install, night vision not as clear as I expected, wireless reception not smooth. pictures stutters. The wireless cameras and receivers were easy to match up. Reception range is ok. Foliage obscures the distance some. We have 3 of the cameras at a building approximately 350 feet away and reception is ok with 1 bar of signal. This includes 1 camera inside the building placed at the skylight. The IR works very well and projects a great view out to 60-70 feet. One camera has issues, but the company is working with us to correct the problem. Camera cords have plenty of length on them to allow good placement without excessive extension cords. I would have liked a manual for the monitor operations. Also would have liked a 6 picture view option for the monitor seeing the unit only comes with 6 cameras. I got this after already owning a wired system from Defender. I love both systems. They both work great. As far as I can tell, the only negative is that you have to have a plug for each camera, but that is a minor thing compared to what you get. I would definitely recommend and order another. Easy system to install. Cameras connected as soon as button was pushed. Great picture day and night.